There are many products out there to build interactive timelines and embed them in websites. How do you choose? 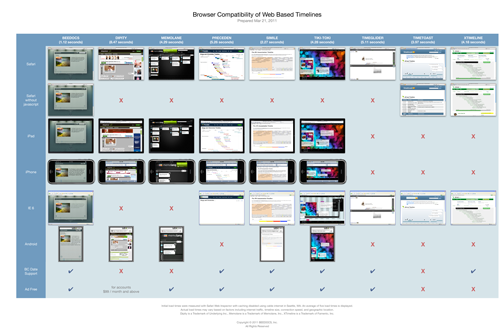 With that in mind, I made this comparison chart of all the interactive web timeline products that I know about. Please download the full PDF version (12.6 M) so that you can zoom in to examine the details. The first thing that I'd like to point out is the load time listed at the top of each column. Keep in mind that if you are embedding a timeline in your website, the amount of time it takes the timeline to load will be added to the time it takes to load the rest of the your page. Next, note that most of these products look good in modern browsers such as Safari 5. Even so, some of the sites add intrusive advertising above the timelines which your audience will need to scroll past in order to navigate your timeline. Next we have screenshots on iPad and iPhone. What isn't pictured here is how well (or how poorly) these timelines interact with touch events. I encourage you to visit each of these sites on your iPhone and give it a try for yourself. Pay particular attention to how well each timeline does at giving you insight into the relationships between events when displayed a small screen such as that of an iPhone. The next row shows how each page looks in Internet Explorer 6. Let me tell you, developing web sites for IE 6 is an incredible pain and I, like other developers, can not wait until it is no longer in use. Even Microsoft has asked people to stop using it. However, according to Microsoft, 12% of the world is still using that browser. If you want to publish a timeline that everyone can use, you need to consider it. This is especially true if you have a global audience. Finally, I posted a row of Android phone screenshots. Similar to the iPhone images, consider not only whether or not the page loads, but consider if the design of the timeline is functional in that form factor. It is difficult to make direct comparisons between all these products as they are targeted at a wide range of target audiences and use cases. For example, some are focussed on charting social network feeds, others are more like Timeline 3D in that they focus on historical charts. Note that only about half of the web timeline products support BC dates of any kind. I hope this chart is useful. I do not intend for this comparison to be disrespectful to any of my competitors. Each product is focussed on different goals and each has unique features that the others do not. However, if you are creating a timeline to share with a wide audience, please keep in mind the perspecitve of your audience when choosing the best product for your particular needs. I was wondering if BeeDoc had a feature where the user could "zoom-in/zoom-out" from the timeline? For example, zoom into the 80s and then zoom out into the 20th century? Andrea, thanks for your question. I just sent you some suggestions via e-mail. Terrific -- very informative. I believe that timelines on the web will soon explode thanks to the iPad + the visual appeal and simplicity of timelines -- simple not for the timeline creator, and certainly not for the software developer -- but for personal information consumers! Hello Adam. I am one of your competition. You have produced a very interesting chart. Thanks for featuring www.tiki-toki.com in it. I should point out a small inaccuracy - tiki-toki has supported BC dates from day one. You have a cross under our BC support. Anyway, good luck with Timeline 3D. You have a very cool product. Alex, congratulations on your recent launch! I am very sorry for the mistake in the chart. I just corrected it.